In 1956, Nambara captained the baseball club of the University of Tokyo (UOT), a member of the prestigious Tokyo Big-6 League. 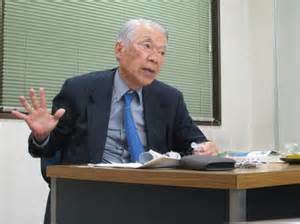 After graduating from the University of Tokyo in 1958, he worked with the Bank of Japan (BOJ) for 36 years followed by the Export-Import Bank of Japan for 5 years before joining Dentsu Inc., an international advertising and public relations company in Japan. During his tenure of BOJ, he studied at Yale University on Fulbright scholarship, seconded to the Asia Development Bank in Philippines and was assigned to major BOJ offices including New York. As a very passionate and capable leader, Nambara started to serve on the board of JUBF without pay after his retirement from Dentsu Inc. in 1999 and was subsequently appointed Deputy Chairman in 2004. Eiji Hatta, President of Japan Student Baseball Association, praised Nambara’s long dedication to student baseball and pledged that he and his colleagues will follow the footsteps of Nambara by putting baseball as an integral part of school education to help form fine character of student athletes.